Constantine Metals (OTC Other: CNSNF; TSX-V: CEM) has entered into an agreement to acquire a 100% interest in the 423 claim unit, 68 square kilometer, Golden Mile property near Timmins, Ontario. The Property is located 9 kilometers northeast of Goldcorp’s multimillion ounce Hoyle Pond deposit and is comparable in size to the West Timmins and Main Camp holdings of the major gold production companies operating in the Timmins Gold Camp. The Golden Mile Property covers the important Pipestone Fault System where it crosses the “Porcupine Giant Mine Corridor” that has produced more than 55 million ounces of gold. This structural intersection, which contains excellent targets within the Kidd-Munro volcanic sequence and adjacent Porcupine sediments, is overburden covered and has seen very limited drill testing for gold. The past-producing Clavos Gold Mine is located 5.4 kilometers to the east of the Property and the Frankfield East gold deposit (1.2 million ounces gold) lies 14 kilometers northwest of the Property, on or near the Pipestone Fault system. A major flexure in the Pipestone Fault system where it is crossed by the projection of the “Porcupine Giant Mine Corridor” is considered to be a favourable structural feature that may localize gold deposits. Constantine Metals (OTC Other: CNSNF; TSX-V: CEM) has signed a letter of intent with Carlin Gold and Urban Select Capital to spin out the Constantine-Carlin Yukon joint venture assets (the “Yukon Properties”) into a subsidiary of Urban Select (“SpinCo”). The spin-out will consolidate the joint venture ownership of the Yukon Properties into one company and allows Constantine to focus its efforts on the Company’s core assets in Alaska and Ontario. Under the terms of the LOI, Constantine will receive $500,000 in cash and approximately 14.2 million shares in the SpinCo as well as future share payments if mineral resources are defined on the Yukon Properties. Concurrent with completion of the transaction SpinCo is to complete a $4,000,000 financing that will fund the cash portion of the acquisition cost and provide working capital to explore and drill the Yukon Properties in 2012. Constantine’s anticipated pro forma ownership of the new company will be 28.7 percent, with an estimated market value of $3.5 million. Constantine will have board representation in SpinCo and provide technical advisory services. Constantine Metal Resources (OTC Other: CNSNF; TSX-V: CEM) has final results from the 2011 drill program(100% partner funded) carried out on the Company’s 100% owned Trapper Gold project, northern British Columbia. Mineralization at the Main Gold zone has now been confirmed in drilling over a strike length of 2.3 kilometres. New results include gold-rich sulfide stockwork, including semi-massive mineralization, at the west end of the zone where it has a north-south width of 100 to 150 metre and been drilled to a depth of 150 metres. 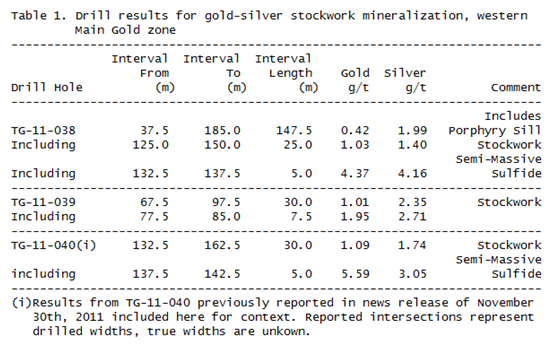 The zone projects to surface where grab samples have returned up to 14.05 g/t gold, and remains open at depth and along strike. Results of drilling into this target, as provided by Ocean Park, are summarized below. To view a trailer for the upcoming panel discussion on the Yukon region, just click on the graphic below. Constantine Metal Resources (OTC Other: CNSNF; TSX-V: CEM) now has initial assay results from the 2011 drill program at the Company’s 100% owned Trapper Gold Property. The drill program was carried out and funded by Ocean Park Ventures, which can earn a 70% interest in the property by spending $9.75 million in work expenditures and issuing certain cash and share payments to Constantine. To date, 8,581 meters have been drilled across 42 holes, 24 of which have assays available. Highlights include in drill hole TG-11-011, 2.51 g/t gold over 22.86 meters, including 9.18 g/t gold over 4.26 meters. Gold-silver +/- copper, lead, and zinc mineralization has been identified in multiple different environments within an inferred large copper-gold porphyry setting. At the Main Zone, drilling has intersected gold mineralization over a 2.2 kilometre strike length and includes both porphyry hosted and structurally controlled gold. Porphyry hosted mineralization, which represents a potential bulk tonnage target, consists of disseminated and stockwork sulphide within near-surface feldspar porphyry dykes and sills. Constantine Metal Resources Ltd. (OTC Other: CNSNF and TSX-V: CEM) announced today the final round of results, with several new high-grade gold intersections, from the 100% owned Munro-Croesus Gold Project drill program located 75 kilometers east of Timmins, Ontario. The 7280 meter drill program tested the Croesus Mine target at shallow and moderate depths, and the Four Corners property at the Canamax and Perry Pond targets. Constantine Metal Resources (OTC Other: CNSNF; TSX-V: CEM) is exploring for Carlin-type gold deposits in Yukon’s Selwyn Basin, and in a 50/50 JV with Carlin Gold, controls 4,967 claims in twelve gold property areas totaling approximately 1,000 square kilometers. Approximately 12,000 soil, silt and rock samples have been collected to date as part of a $1.2 million exploration program. At the TUT property, laboratory data has confirmed and expanded a gold and arsenic soil anomaly, which spans 6.5 kilometers in length and ranges from 300 to 1200 meters in width. Individual soil samples within this area are as high as 2.81 g/t gold and 5.87% arsenic. On-site XRF analysis of detailed infill grid samples has defined a greater than 1000 ppm arsenic core to the anomaly that is 1.5 kilometers in length and 500 meters in width. Gold assays for over 1600 infill soil grid and rock chip samples are pending. Seven mineralized grab samples from initial prospecting within the 1000 ppm arsenic core anomaly area range from 2.01 g/t gold to greater than 10 g/t gold, with an average grade of 5.21 g/t gold (overlimit assay is pending for sample exceeding upper analytical limit of 10 g/t)*. The core of the soil anomaly correlates with a zone of altered and heavily fractured rhyolite dikes that are commonly associated with quartz-arsenopyrite veining. Dikes within the zone average 35 to 50 meters in width and are located near the outer edge of a contact metamorphic aureole, approximately one kilometer outboard of a Cretaceous-age quartz monzonite stock. You are currently browsing the archives for the Constantine Metals category.